Who Wants to Change the World, Must First Learn Esperanto! Esperanto, the artificial "universal language" devised in the late 19th century, gained adherents and interest in the 1920s and early 1930s, as part of the search for enduring peace after World War I. This is a promotional map for a course in Esperanto offered at Nimegen in the Netherlands, probably in 1930. All of the place names on this world map are in Esperanto, although the title and the text are entirely in Dutch. The potential of the language to bridge cultural gaps is dramatically illustrated by the two figures at the top, one black and other white, shouting at each other from opposite ends of the map. The Esperanto Center at Nimegen was active from the mid 1920s into the 1930s, and just such a course was advertised in De Eerste Heemsteedsche Courant for Jan. 31, 1930. http://bostonraremaps.com/inventory/world-map-in-esperanto, accessed October 29, 2015. 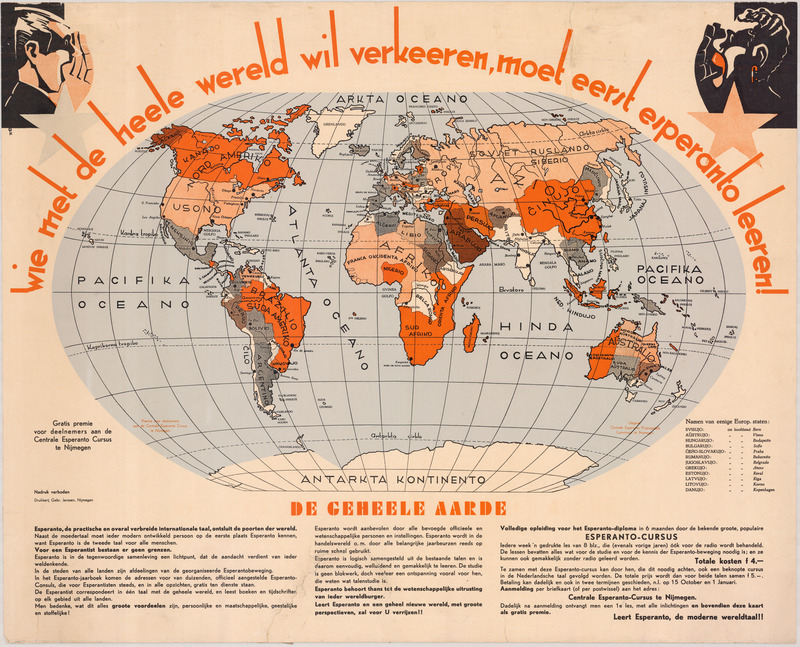 The text below the map describes a six-month course to be offered in Nijmegen, promotes the benefits of Esperanto, and express optimism about its spread worldwide. Ibid.